or many years, my family would celebrate Christmas eve by enjoying a dinner of tamales and chili. This also included a cool salad and a rich desert. Happiness was serving these delicious foods on china that celebrated the season....Lenox Holiday along with Waterford crystal. Lights were dimmed and candles were carefully lit. Remembering the feeling of contentment and peace, I recall seeing the glow of Christmas lights sparkling upon the tree and the soft glow of candle light. However the most wonderful memories are of all of us together, laughing and sharing memories of the year gone past. More than gifts were given. Given were priceless memories and true joy. 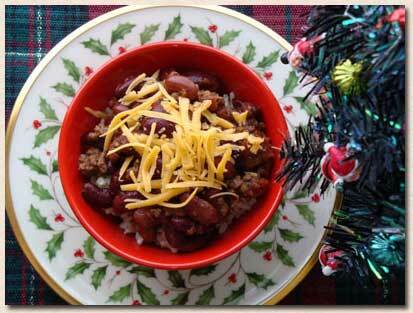 Along with those precious, warm memories, is this recipe for Christmas chili. I discovered it many years ago within the pages of a Better Homes and Gardens magazine and serving it has become an annual event. May you enjoy the treat of food and family this Christmas season, and perhaps, throughout the coming year. Bring to boiling and then reduce heat. Slowly simmer, uncovered, 2 to 3 hours, stirring occasionally. Makes 12 (1 cup) servings. I usually prepare rice also and serve a ladle of chili over the rice in a deep bowl. Then I sprinkle sharp cheddar cheese over the top. A spoon of sour cream is delicious, also. The flavor of this chili becomes more delicious after freezing and it certainly makes enough for left-overs.